NEW: Nuki Smart Home Action for your Google Assistant! Our new native Google Assistant Smart Home Action makes it very easy for you to talk naturally to your Google Assistant and tell it to unlock, open, or lock the door. Querying the status of the door is also particularly practical. 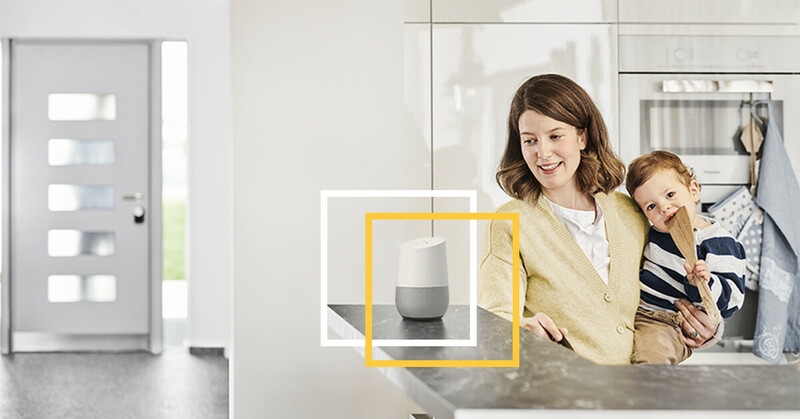 For example, Google Actions work through a Google Home device or through the Google Assistant app on Android smartphones. Issuing a command through the previous custom Action is a little more cumbersome. Custom Action commands might be “Okay Google, tell Nuki to lock the door,” or “Okay Google, please lock Nuki.” Users always had to mention the word “Nuki” in the voice command, but with the new smart home Action, all they still have to say is “Okay Google, lock the door“. Another new feature is that you can open or unlock doors with Google smart home Actions, which was previously impossible with either Custom Actions or Smart Home Actions. Until now, users could only use voice commands to lock the door and query the status. For security reasons, unlocking and opening the door only works with 2-factor authentication, i.e. the Google Assistant requires a PIN code to unlock the door. To set up the Skill, simply open the Google Home app on your iOS or Android smartphone and click “Add” > “Set up device (works with Google)” and Nuki will appear in the list of suggestions.